In AEF news… - Argyle ISD Education Foundation, Inc.
was presented with a grant for $15,000.00 by the CoServ Charitable Foundation at the April AISD School Board meeting. This grant will provide for campus grants at each AISD campus and for a scholarship for a graduating Senior. ​Congratulations to our​ 2017 Ranger Raffle winner, Mr. Wagner! ​a grant of $3,750 for each campus! ​​Congratulations to Pam Arrington for being awarded the 2015-2016 Lisa M.Z. Endowment Award for teaching excellence! The district was able to use these funds to provide two new "above and beyond" teachers for district: a last minute teacher was added for first grade to bring down class sizes and a computer programming teacher at AHS! Our Board members, as well as Dr. Wright and a few of our donors, made their way around the district awarding grants! 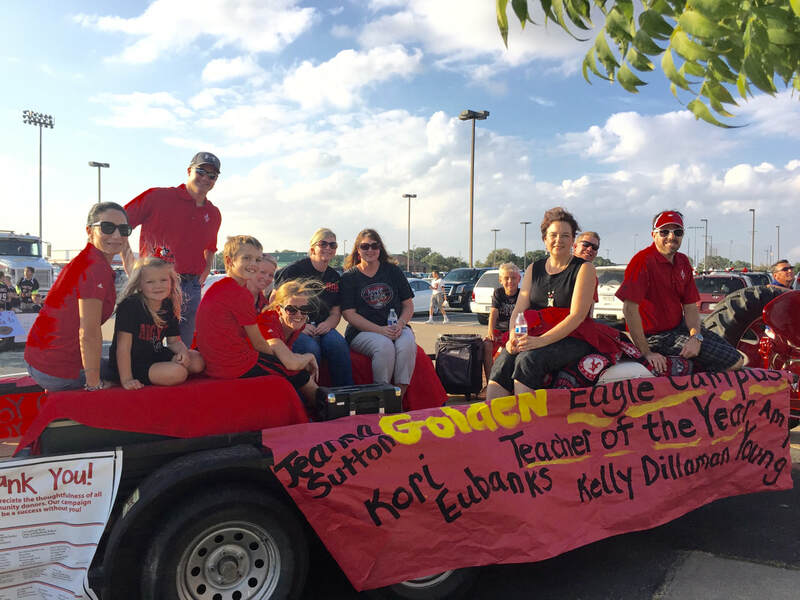 during the 2015 Homecoming Parade on October 21st!